I’m a sucker for comic-hero team-ups, which is why I’m ga ga for the five issue Magnetic North storyline currently running in Ultimate X-Men. 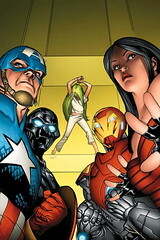 It features both the Professor X’s band of super mutants and the Ultimates — the latter being led by the quick-to-spark Captain America. It doesn’t have the bite of Ultimate War, which featured the same heroes and ran two years ago, but it’s worth the read. The whole plot revolves around Magneto’s elaborate scheme to escape from the Ultimate’s inescapable prison for superhuman bad guys. It sounds very silly and cliche, yes, but Brian K. Vaughan, one of the smartest writers in comics right now thanks to Runaways, stirs up the action without it feeling stale. What’s got me head scratching however is a story element that’s been running in several issues now: In an effort to feel contemporary (or perhaps to appease a growing gay, comic-reading audience), a few of the X-Men are now homosexuals. Colossus, the steely muscle of the X-Men, is the most well known (and tormented) of the bunch. It all feels very forced to me and untrue to some of the heroes’ origins, but there you have it.